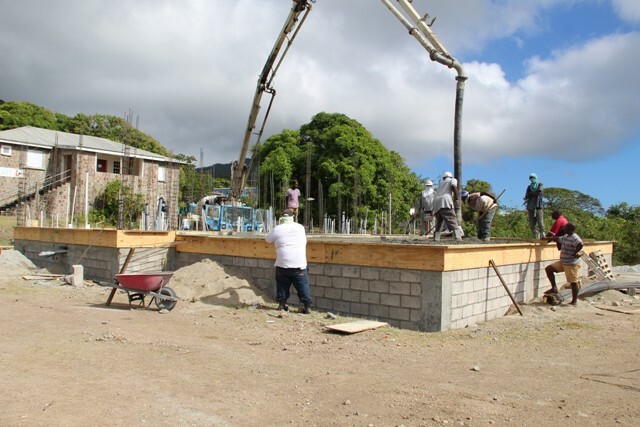 NIA CHARLESTOWN NEVIS (February 04, 2019) — Work on what is earmarked as the new home of the Gingerland community festival, Gingerama, moved to a new phase on Friday February 01, 2019, when the concrete flooring was laid. The project which falls under the Ministry of Social Development commenced in December 2018. Hon. 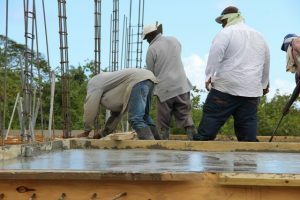 Eric Evelyn, Minister of Social Development, Minister of Culture and Area Representative for the St. George’s Parish, who laid the cornerstone for the Gingerland Cultural Centre in January also witnessed the concrete flooring being poured and expressed satisfaction with the project’s progress. “We would have had quite a bit of work done by the electrician, by the plumber, by the contractor and of course we have also included Information Technology (IT) as a part of the project as well. So Information Technology [Department] would have come and done some work. Also we would be having some air-conditioning as well. So all in all things have progressed well to my estimation… I am extremely pleased with the way the work is progressing here,” he said. The project had been conceptualised by Hon. Vance Amory, former Premier of Nevis and Area Representative for St. George’s Parish. However, years later it is being executed under Mr. Evelyn’s watch. The facility is expected to serve as a facility in which all forms of cultural arts could be taught. Mr. Antonio “Abonaty” Liburd, Executive Director of the Culturama Secretariat who is seen as the project manager gave an insight into the project. “This is only phase one of the project where we are erecting the building. Within the structure we are going to be having four dress rooms and four bathrooms and we are going to have a performing area, a stage area…We want to complete the first phase by putting up concrete fencing and also an entrance gate,” he said. Also included in phase one will be the construction of some booths on the eastern and western sides of the site. They will be made available to the people of Gingerland in an effort to stimulate economic activity in the area. In phase two, which will be undertaken in 2020 once funds become available, plans include the erection of a stand on the southern end of the grounds. “Under the stand we are going to have bathroom facilities, a kitchen. We are going to have a bar so that the persons of Gingerland can come here as well. As the minister said it’s a multi-functional centre and so we want to teach some culinary skills as well to the persons residing in the immediate area of the facility,” he said. Mr. Liburd used the opportunity to announce plans already slated for the facility during summer. 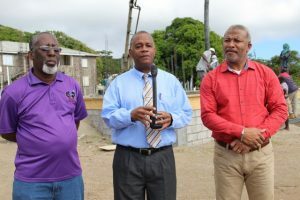 “I want to make a promise to the people of Gingerland and the people of Nevis that at least one activity for Culturama this year is going to be carried right here at the Gingerland cultural village,” he said. Meantime, Hon. Spencer Brand, who was also present, also expressed satisfaction with the work already done at the construction site. “I am very impressed with the progress that I am seeing here. I think this project started in January and the level of work that we have seen here has been very impressive. I know that he has given a clear indication to the contractor that this project must be completed by a certain time and I’m happy to see that it’s progressing very nicely. “I believe that from what I am seeing here the project looks very much on schedule and as the Minister of Public Works, we of course are giving the support to the Ministry of Culture to see to it that they complete this project on time, on budget and of course at a very high standard,” he said. 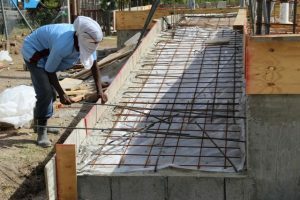 Contractor for the project is Mr. Phillip Walters, who has employed seven workers.